Many investors assume that changes in a mutual fund’s net asset value (NAV) correlate directly to the total return of the fund. That’s not necessarily true as dividends, distributions and sales charges all factor into the equation. Judging a fund’s performance based solely on the NAV can result in poor investment decision making and unintended tax consequences. In this article, we’ll examine how a fund’s NAV is calculated and how it, along with the factors mentioned above, results in the fund’s total return. A fund’s NAV is calculated by taking the total net assets of the fund and dividing by the total number of shares outstanding. For example, if a fund has $100 million in assets and 2.5 million shares outstanding, the fund’s NAV is $40. Want to know more about how NAV is calculated? Click here. All asset additions and subtractions to the fund are reflected in the fund’s NAV. If a stock held by the fund pays a dividend, the dividend is added to the fund’s net assets and results in a rise in the NAV. Management fees and expenses that are charged periodically by the fund decrease the NAV. Dividend and net realized capital gains distributions paid out to shareholders decrease the fund’s NAV as well by the amount of the distribution. A fund’s total return takes into account capital gains and losses from the securities held within the fund, dividends and interest earned by the fund, and expenses charged by the fund. 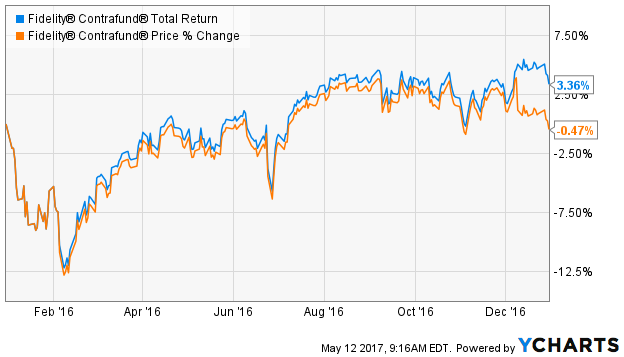 Clearly, total return is a more accurate reflection of a fund’s performance and the return that a shareholder actually receives. It’s important to look at a fund’s total return and not just any one component of the total return in isolation. Dividend seekers may focus just on a fund’s yield, but many high-performing funds don’t pay a dividend at all. Investors looking only at a fund’s NAV may assume that the fund has posted a loss if the NAV has declined when, in reality, the fund has delivered a positive total return once dividend distributions are considered. In case if you are wondering whether mutual funds are right for you, you should read about why mutual funds, in general, should be a part of your portfolio. The Fidelity Contrafund (FCNTX) provides a good example of the difference between looking at the fund’s NAV and its total return. Contrafund opened 2016 at a share price of $98.95. On the last trading day of the year, the fund closed with an NAV of $98.46. Based on NAV changes alone, it would appear that the fund lost about 0.5% on the year. But Contrafund made both dividend and capital gains distributions during the year. Even though those distributions were taken out of the fund’s assets (and reflected in a lower NAV), they are still part of the shareholder’s total return. In total, the fund distributed $3.46 per share in capital gains and $0.29 per share in dividends. Add those to the equation and shareholders of Contrafund actually enjoyed a total return of around 3.4% on the year. Total return gives a more accurate representation of the return that shareholders will actually see, but there are several elements that will factor into it. Dividend and Capital Gains Distributions – As illustrated above, fund distributions result in the biggest difference between NAV and total returns. Funds are required to distribute dividends and net capital gains to shareholders on at least an annual basis and many funds make these distributions regularly. Sales Charges – Total returns are often listed with and without sales charges. Commissions get taken right off the top before an investment is even made. Fair Value and Swing Pricing – A fund’s NAV can be adjusted using fair value pricing if security prices within the fund are stale. Swing pricing can adjust an NAV if there are large purchases or redemptions within the fund. When judging the overall performance of a mutual fund, always look at the fund’s total return instead of just the changes in its NAV. Distributions made by the fund may reduce the fund’s NAV but they still belong as part of the shareholder’s overall return. Viewing returns in this manner gives a more accurate depiction of a fund’s success.